A recent mice study shows that vaping flavored e-juice causes more relative lung damage than smoking traditional cigarettes. Despite the e-cigarette industry’s attempts to market vapes and e-cigarettes like the JUUL as safe alternatives to smoking traditional cigarettes, a recent study in the Journal of Physiology showed significant signs that vaping causes more lung damage than regular cigarettes, particularly if the e-juice is flavored. Does vaping cause lung inflammation? Current research shows significant inflammation in the lungs of e-cigarette users, regardless of whether the e-Juice contains nicotine or flavorings. It’s important to note that the use of flavored e-Juice appears to cause the most lung inflammation. Vaping causes lung damage that can be measured by various tests that mark the increase in inflammation of lung tissue and cells. 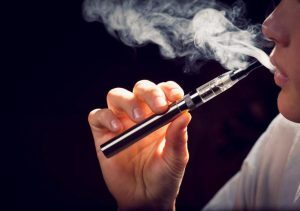 Even a person with a short history of vaping can show symptoms of inflammation that are connected to COPD, asthma and lung cancer. “Popcorn lung” is a condition known as constrictive bronchitis or bronchiolitis obliterans. The name is derived from an inflammatory condition found among workers that produce and pack commercial microwave popcorn. Popcorn manufacturers added a flavoring chemical to their products called diacetyl. This creates a “buttery” flavor and scent that is unmistakable in microwave popcorn. Manufacturers of e-cigarette liquids are adding diacetyl to their vape products to create that same buttery flavor. The chemical is therefore heated into vapor and inhaled, causing the same inflammation found in the workers in the popcorn manufacturing industry. The attorneys at Aylstock, Witkin, Kreis & Overholtz are investigating claims related to the growing industry of e-cigarettes. From chronic lung inflammation and damage to deceptive and illegal advertising of the extremely popular JUUL vape pen to children and teens, we are disturbed by the injuries happening to users of e-cigarettes. If you or a loved one has used a vape product and developed lung inflammation or other injuries, contact us today using the form on this page. There is never a fee unless we recover compensation for you.